​Royole Corporation CEO Liu Zihong announced a new product called “FlexPhone, which is bendable, and can be put on the wrist. It can be straightened and it works as a common phone. It’s a device that exists because of flexible displays and sensors developed by Liu’s company. With its thickness of zero-point-zero-one millimeters, the material can be rolled up freely and made into various products. It’s transparent and looks just like like a piece of paper and functions as a keyboard. It can be connected to an iPad via Bluetooth. 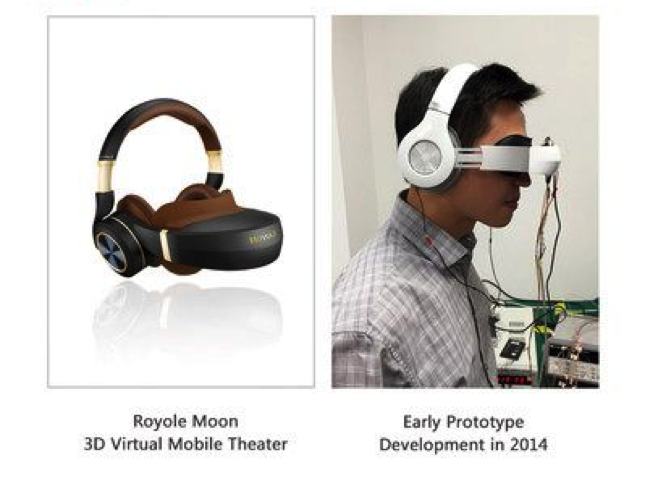 Royole Corporation has also been presented with a Gold Award in the European Product Design Award competition for its innovative Moon 3D Virtual Mobile Theater in the Media and Home Electronics – Consumer Electronics and Cameras category. Royole Moon, designed and engineered for movies, gaming, and more, combines two Full HD 1080p AMOLED micro displays at over 3000 ppi resolution that simulate a giant 800" curved screen with stereoscopic 3D, and active noise-cancelling headphones. The combination delivers cinematic movie-watching and immersive gaming experiences anywhere the wearer desires. Moon's design consists of Royole's patented foldable design (the world's first in a headset), ultra-soft headphone covers, and a breathable eye cover to ensure long-term comfort. The scalable Moon screen gives the wearer full control over screen size for a personalized viewing experience. It includes 32GB (128GB upgrade available) of internal storage, and a battery life of up to five hours of continuous video playback. Advanced optics allows most eyeglass wearers to enjoy Moon without their corrective lenses. Founded in 2012, the company now owns more than 700 IP Rights both at home and abroad.